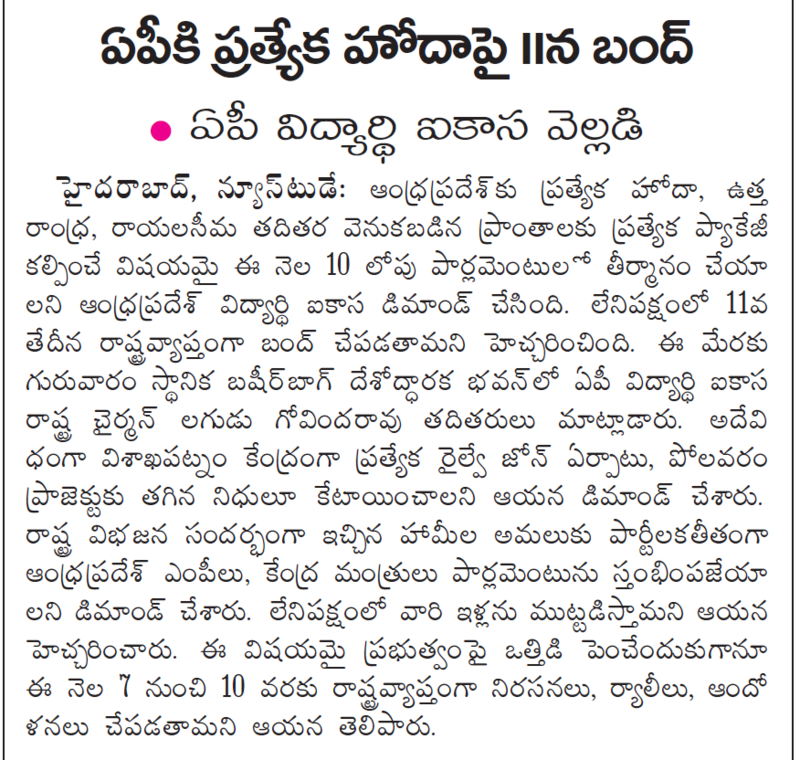 Bundh on 11th august for all educational instutions across the ap state. For getting special status to the Andhra Pradesh this 11th august is declared as bundh for all educational institutions. New Andhra student JAC’s expressed: On demanding for special status to Andhra pradesh JAC’s Leader Ayya Swami declared a state wide bundh on this 11th August.Ayya swami visited Nagarjuna University Investigation Committee and where he spoke to the media there.On special status issue,he started a program in sending 10,000 postal cards to Prime Minister and President.He also spoke about the recent incident occured in ANU about rishitheswari’s death and added that,about the rishitheswari’s case, it should be disscused with the sitting judge in the high court and also demanded to arrest the principal of the college and 20 Lakh should be giving to the family of the rishitheswari’s family. Apart from this it is declared as bundh on 11th august for getting special status to Andhra Pradesh.And even Chief Minister N Chandrababu Naidu said TDP would continue its struggle till the central government accords special status to the state.Addressing a meeting of Telugu Desam Party (TDP) in Vijayawada, he said Andhra Pradesh’s case for special status was different. The chief minister said the state was not divided by the previous UPA government in an equitable manner. He said justice was not done to Andhra Pradesh and hence special status was being sought.He made it clear that TDP, which is a partner in National Democratic Alliance (NDA) government at the centre, will continue its efforts to get the special status for the state. And to have the special status,the JAC’s support is also high in this and in accordance to that,this 11th August is declared as bundh for all educational institutions for supporting to the special status for Andhra Pradesh. Sir please release the R13 2-2 results. So many students are waiting for the results. Please release the results as per as early possible.